It's hard to argue with Google's track record. The company has scored a hit in nearly every space in which it's dabbled: search, email, ads, office software, etc. There's always been one glaring exception to this rule, however: social networking. The company hasn't made much of a dent in a world dominated by Facebook (and, once upon a time, MySpace and Friendster). For Google+, however, the company dove in with both feet, launching a multi-faceted service that brings a lot to the table with features like Circles, Hang Out, and Huddle. Is it enough to end Google's streak of misteps in the social world? Join us as we take a dive deeper into Google's latest attempt to find out. Those who have spent any time at all on Facebook will find it nearly impossible not to draw comparisons upon logging in. Let there be no question: Google is going after the world's largest social network -- and it's doing so in a big way. The page is constructed around a familiar content stream populated with content from your friends' updates and posts -- things like links, photos, and location updates. The "Circles" feature comes into play in the stream, offering users the option of sending posted content to specified groups or making it public for all the world to see. Perhaps to emphasize the importance of content, the stream shows shared items in a much larger format than on Facebook, particularly when media is added. We think this is nice for now, but as friends lists grow, we're sure to expect a lot more scrolling. Updates refresh on the page automatically, and are instantaneously able to be commented on and shared with other lists. The familiar Facebook "Like" button has, not surprisingly, been replaced by Google's soon-to-be-ubiquitous Plus One button. Pretty much every time something happens on the service, Google will pop up a red notification on the top tool bar and send you an email, just in case you weren't paying attention. There's a list of other content streams located along the left side of the window: toggle between streams from different groups or access a chat client eerily similar to the one present in Gmail. This pane also includes an abbreviated friends list and a Twitter-like suggestion list, but also contains an ad for the site's mobile version. The top bar, meanwhile, boasts the obligatory search field and shortcuts to the homepage, photos, your profile, notifications, settings, and your other Circles. Google is really looking to set itself apart from the pack with its "Circles" feature (that it has denied in the past). 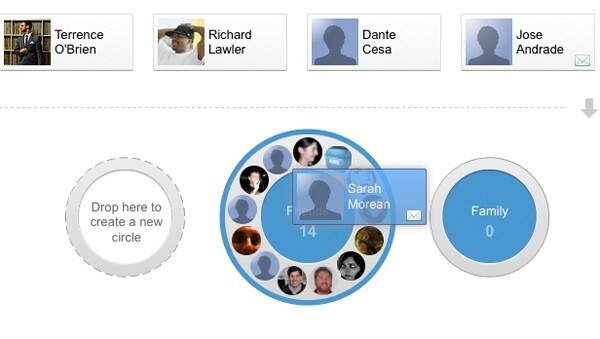 You see, Google lets you create groups, or, "Circles," to which you can add and remove contacts. This means that you can separate your work buddies from your drinking buddies -- or, "epic bros" as Google suggests categorizing them. Google's also tapping into its many algorithms to suggest contacts to be added to Circles, much like it does with emails in Gmail -- though you can still add contacts directly by email address should you so desire. The process of creating new Circles and physically dragging contacts into them is quite dynamic -- we're definitely impressed with the interface. "Sparks" is a pretty vanilla take on RSS feeds -- you do remember those things, right? 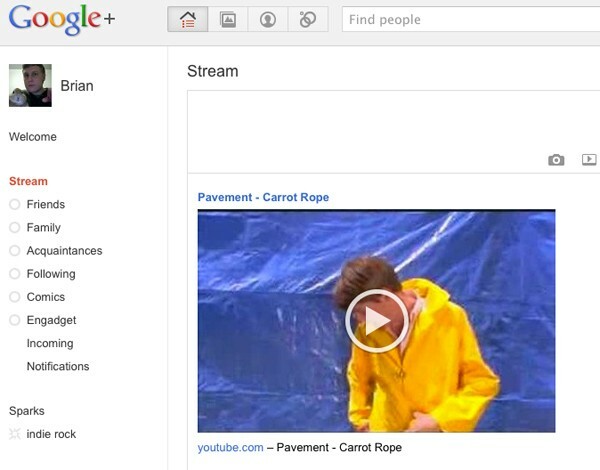 Lists are curated by searching and adding topics in a pretty straightforward manner. Stories that appear in your feeds have a "share" button, making it easy you post them to your stream. We have a sneaking suspicion that Google's trying to make its robust sharing options the star of the show here -- you can share almost anything from anywhere in the entire service. 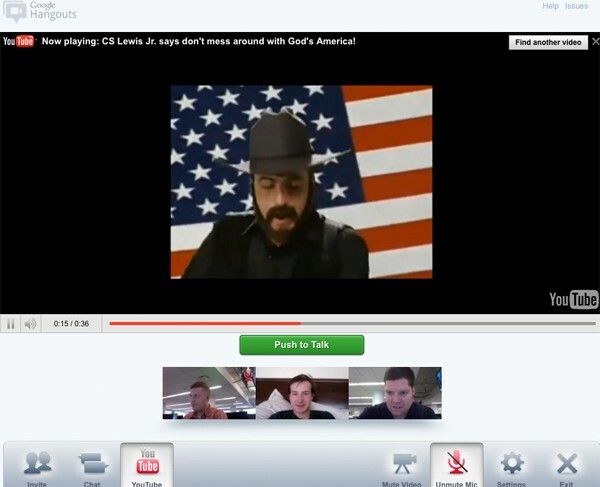 Plus' "Hangout" feature has its sights firmly set on Skype's multi-user video chat. Once the plug-in is installed, clicking the button will deliver a note to your followers' stream letting them know that you're "hanging out." Clicking the button triggers a Skype-like window with the faces of those you're chatting with. Whoever has the floor appears in the main window -- and like the aforementioned service, it allows for text chat along the side. Unsurprisingly, the feature also offers YouTube integration, letting users collaboratively watch videos and create running commentaries in the chat -- or verbally using that new Google Voice Search tech. We should mention that we are talking about Google here, so there's also an obvious push for the mobile version of Google+ as well. No one should be particulary surprised that Android is the first mobile OS to be getting a crack at the service -- there's already an available in the Market. We've been told that there's an iPhone version of the app also on the way (though for the time being, iPhone users can access the page through mobile Safari). The "Huddle" group-messaging feature -- one of the biggest selling points of the mobile version -- doesn't seem quite ready for prime time, either. 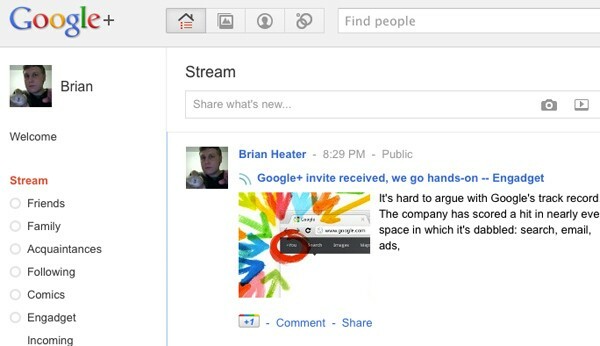 When news of Google Plus' arrival broke today, we called the service an "all out assault on social networking." After playing around with it for a bit, we believe that our previous description seems even more apt. Past services like Buzz have suffered from a half-baked approach to the space, but Google has clearly pulled out all of the stops this time. With direct shots at some of the leading market software in the form Facebook and Skype, Google is in a position to extend its search dominance to other realms. As usual, the company has created a smooth, intuitive, and enjoyable experience. However, now comes the hardest part: convincing people that they need another social network in their lives, because without friends, you're just hanging out by yourself.